1/2 oz. Sugar Syrup (substitutions include: Maple Syrup, Honey, Stevia)Muddle mint and a cucumber slice in a cocktail shaker. Add other ingredients and ice. Shake and strain into a chilled martini glass, and garnish with a slice of cucumber and a fresh mint sprig. This great gin cocktail is based on the Cuban Mojito, its aka an English (Country Club) Mojito. 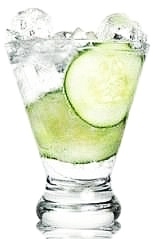 As mentioned, muddling the cucumber brings out an incredible flavor that simply amazes people. It has freshness that makes this cocktail absolutely perfect as a part of your drink mix. Substitute with Vodka if you wish.